The SL-550TRS is a top or rear-venting direct vent featuring a shallow depth (16 1/4") that allows it to be installed virtually anywhere. 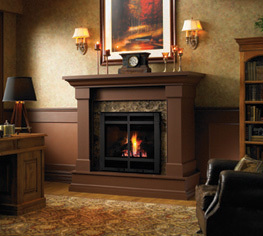 Its sealed combustion offers high efficiency while maintaining your indoor air quality. This model is AFUE rated as a heater, and can be used with an optional hand-held remote control or wall thermostat.